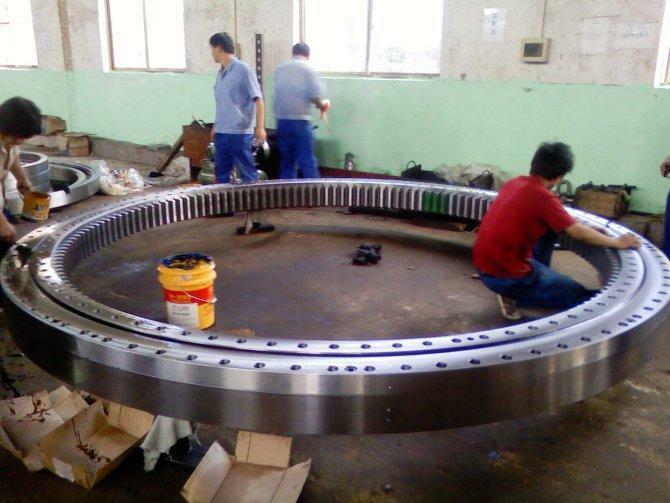 Premature failure of Rings for slew bearing is a common problem, especially if the ring has a large diameter of about 8 to 10 inches or when they are used in heavy equipment, like excavators, cranes, etc. that are rotated very frequently. Fortunately, with the help of some useful tips and regular maintenance, more than 90% of these failures can be prevented. Slewing bearings are commonly used in heavy applications for supporting heavy loads that oscillate or turn slowly, for instance, in conventional cranes, swing yarders, tank turrets and radar antennas. Heavy load and frequency at which the equipment is often used lead to premature failure of these slew bearings that are mostly caused due to insufficient lubrication, overloading, contamination and incorrect installation. However, with regular maintenance, as much as 90% of these failures can be avoided. Some of the most important maintenance tips are mentioned below. 1. Regular Greasing: Rings for slew bearing require extreme pressure, heavy-duty grease. When the lubrication is insufficient, waviness or roughness can result in surface damage. Later, this surface damage results in cracks that are followed by flaking. Thus, it is very important to apply healthy amounts of heavy-duty grease at the fittings that are located around the circumference of the bearing at regular intervals. 2. Inspect Purged Grease: Contamination is a common reason for slew ring bearing failure. To eliminate this problem, you can pump grease in the bearing till the time you can see old grease squeezing from the seal. This will help in eliminating the contaminants, like dirt and debris. You should also inspect this purged grease to check if they contain any metal chips or grit. If they do, there is a major possibility that there is bearing-related problem. 3. Respect the Load Chart: Many-a-times, even the slightest of overloads can damage the bearing race. A single depression of 1/1000 of an inch can get damaged with consequent overloads and will eventually result in slew bearing failure. 4. Avoid Using Same Approach Angle for Every Job: For instance, if you are digging with an excavator where the load is lifted by the undercarriage and boom in a similar angle throughout the job. This can damage the bearing race, just like how uneven load does. If the job allows, the approach angle should be changed between jobs. 5. Inspect the Damage: While maintenance of slew bearing is very important, they will eventually wear out. A bearing that is severely damaged can start damaging the other components of the equipment, like gear box and drive pinion. Thus, the important thing here is to inspect the smallest of damages and get them repaired to prevent expensive replacements. Also, even when your ring for slew bearing is severely damaged, rather than replacing the bearing, try to get it repaired as it will still cost you about half the total cost of a replacement. Make sure that you add the above-mentioned steps in your maintenance routine to ensure that the bearing functions flawlessly over an extended period of time.